Fig trees in and around the Fort Smith Arkansas area. If the only fig you've had is a Newton, you're missing out on one of the most delicious fruits, which is actually an inside-out flower, that can be grown around Fort Smith with minimal effort! Yes Figs Grow Around Fort Smith! Work closely with the River Valley Master Gardeners on a five-to-ten year Fig growing trial to determine what varieties are suitable for our climate gardening zone. We are seeking information on local Fig trees which have survived multiple years either with or without winter protection. Document and show as many growing Fig trees in our area as possible so people will know what varieties to choose from when they search about Figs and possibly want to grow them, in and around Fort Smith. Most people think about California or perhaps farther South and into Florida when growing Figs comes to mind but in truth, we can grow just about any variety of Fig as can be grown anywhere, depending on how much effort we want to put into it, to ensure survival of the tree(s). There are many varieties of Fig, some considered more "cold hardy" than others and so, more suitable to growing here if we simply want to plant them out in the yard as we might any other fruit tree suitable for our climate, while others will require protection of some sort during our cold winters that will kill most fig varieties. Ok Charlie, what Fig varieties can I grow in and around Fort Smith? If it is listed in the right column blog archive below, then it is a good variety choice. More will be continually added as they are found locally or resulting from the Learning Fields at Chaffee Crossing Fig Trial. We can grow even the pickiest of Fig if we want to have them in containers we can move into a garage or other suitable enclosure during the winter to protect them from killing temperatures and others may suffice in a greenhouse but these are not really the ones we want to focus on in this blog. Most people simply want to plant a tree and not go to a whole lot of effort. It is advised that any Fig variety grown here be given some protection during Winter while young and until they are well established with woody bark. Even then there are no guarantees they will survive. Our purpose here is to help you decide which are the best choices according to known survivors in our area. Variety topics are always in the Blog Archive. 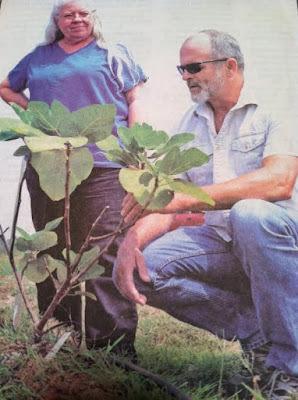 That's Susan Randolph, the River Valley Master Gardener in charge of the five to ten year Fig Trial and me, posing for the photo and pretending to talk about the LSU Purple Fig we put in the ground on July 11, 2015, one of the most hot days of the Summer! Surprising to even me, all forty varieties we set in the ground that day overcame the heat plus transplant shock and are doing fine, except for maybe the Rattlesnake Island Fig that was chopped in half by a weed-eater mishap! I think it too will survive going into Winter but what varieties will survive the Winter? Time will tell. Those with a hunger for figs have a new resource for their research cravings. Manfield resident and nature lover Charlie Little offers an online blog to help area residents identify the varieties and details of different figs that can be grown — and are being grown — in the Fort Smith area. Located at www.figsfortsmith.com, the blog keeps area residents aware of how to grow figs and what environmental conditions will be best, he said. Providing information such as some of the names of the other figs commonly found in the area, Little’s blog is tied into what RVMG members are calling their 5 Year/10 Year Fig Trial, which includes several rows of recently planted fig trees at the Learning Fields at Chaffee Crossing. The trial involves the planting of the first 40 of 122 figs, with fig trial chairwoman Susan Randolph and other RVMG members monitoring and recording the progress. “We’ll collect and tell the information each year over the next five years, and when the study is complete in 10 years, that information will be made available to the public for free,” Randolph said. Randolph and Little said the study’s plan is to not give the trial figs “100 percent protection,” but instead, watch how the figs endure the winter elements with little protection. During the summer months, Randolph irrigates the figs, with the plan to reduce watering when colder temperatures arrive. Little said he hopes the trial and blog will help encourage more people to research and grow fig trees. The various flavors found in figs are one of the many reasons people like to plant and grow the trees, he said. “Some figs taste berry-like, while some have a melon taste and others can have a spicy taste,” Little said. Some figs found in other states and other countries require a fig wasp to pollinate them, Little said. “Those types of figs aren’t here in the Fort Smith area, though, because we don’t have fig wasps,” he said. Some figs, like the one named “Hardy Chicago,” can endure frigid temperatures, Little said. Randolph said he is optimistic the fig trial and Little’s blog will benefit area residents for years to come. “This is exciting,” she said. “With the Learning Fields, we’re doing different trials, and we’re trying to teach people to grow their own food. “And figs taste really, really good,” he said. Since the publication of that article, we have been fortunate to have been contacted by many area Fig growers who read it in the newspaper and have made several new friends. Doors have opened that would have otherwise possibly never opened. I for one and very thankful to Scott and the SWTR for doing a great story. Comments moderated prior to publication. To be planted in a protected location such as the South side of a structure, in well draining soil with full sun exposure. Some say they like to be near a dwelling so the roots can travel under a concrete slab, where they find coolness and moisture. If you don't know the variety of your Fig(s), we may be able to help. It's very common for them to be mis-labeled at nurseries or garden centers. Our Fig friends from all over the world are experts and are happy to help identify your Fig variety. To help you in this, we require a ripe fig photograph, close-up and clear as possible of fig side view, eye and interior cut in half from top to bottom, along with some leaf photo's from lower and higher up on the tree. Any Fig variety listed in the Cold Hardy Fig List by Flavor link below is suitable for our area. Most can only be found from private fig collectors at the fig forums but some may be purchased at reputable nurseries online when available. If purchasing from an online nursery, try to get varieties which are rated for zone 6 if you live in Arkansas, just to be safe. Many Fig varieties are available on Ebay. Bid at your own risk as there are known to be unscrupulous fig dealers in plants and/or cuttings. Rafed's Fig Group on Facebook is a great place to meet new fig friends and also learn who is safe and reputable to buy from among the collectors. Link to his group is in the fig links below.